About Us - "Spreading the joy of Judaism!" It is our goal to create a community where all are welcome no matter background or affiliation. • An organization in Hamilton and Robbinsville, NJ, that provides religious, educational, social, and recreational programming for the community, no matter what age. • A place where you can experience a true Shabbat dinner in a comfortable home-like setting with great company, superb food and stimulating discussions. • A haven to which you can turn when you're stressed or lonely and need a true friend. We are available 24/7 with open minds and wide hearts. • An organization that has gained national prominence as one of the fastest growing and most vibrant, innovative and all-inclusive organizations for Jewish communities in this country. 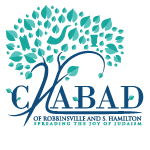 Through all its growth and changes, Chabad's warmth and intimacy remain the same. At Chabad you will always find a friend.